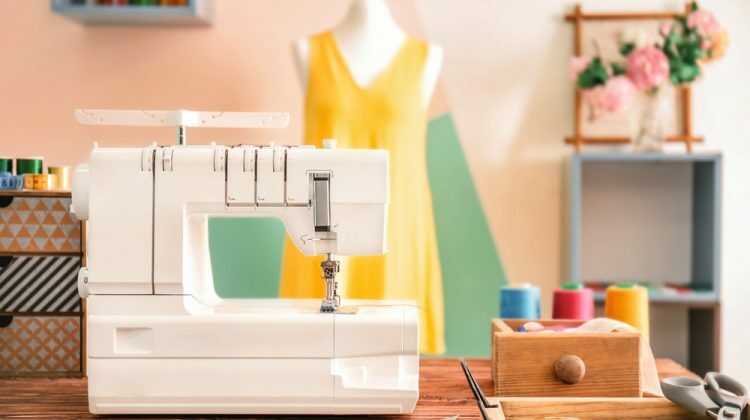 For sewing devotees, organizing your sewing space can be incredibly rewarding and therapeutic. A well-organized sewing room is usually where magnificent sewing projects are brought to life. Check out this list of themed sewing room ideas to inspire you. Take a stab at organizing your sewing room with these creative DIY home organization ideas! A clean finish is always a great option. Ebony and ivory together allows your sewing materials to stand out, making them easy to find. These are excellent color choices for sewing rooms. White has the ability to make a room look bigger, while the contrasting black color looks great a nice accent hue. Pastel colors are known to be easy on the eyes. It is easier to think up amazing sewing designs when you are in a comfortable room. Keep your sewing tools and materials to a minimal amount to maintain a distraction-free zone and give you more space for your creations. Plus, you won’t have a hard time finding things because you’re only displaying what you need. This is just one of those DIY storage projects you must do. Simply choose a particular corner of your house and make it your sewing haven. Hang your sewing tools securely on a peg board and then position your working table underneath it. You can also try these 7 other DIY storage projects to make this space more functional! This themed sewing room idea suitable for crafters who want to keep their sewing areas looking like whimsical wonderlands. The fabric, ribbons, and white-washed table appear to accessorize this pink-walled sewing studio. It would also be nice to incorporate these fabric storage tips and ideas into this cute sewing room idea. The crafty pictures appear to jump out off the wall in this simple, ethereal sewing room. This sewing room idea can add personality and give off a playful vibe in your workspace despite the stark white walls. Try to frame images or cute typography for inspiration. The vintage storage space and the gray mannequin will instantly catch your eye. It feels both rustic and contemporary at the same time. Doesn’t it take you back to grandma’s old sewing room? You would probably enjoy knitting so many cozy winter-themed projects here. If you prefer to work outside the house, then this cottage-themed sewing studio is perfect for you. You can convert a portion of your garage or guest house and you are free to sew away to your heart’s content! If you are looking to start on one, try this homey sewing project for starters. If you like to bring nature into your sewing room, then give this studio design a try! Just roll all your fabric neatly underneath a spacious wooden table and place a few plants around the room. You can also try these home organization ideas to keep your sewing room airy and spacious. This boutique-inspired sewing studio is in the style of classic French boutiques. The chandelier and the miniature mannequins on top of the cupboard are special elements that gave it a chic vibe. Don’t you love how all the sewing materials and fabric are stored in cute boxes and jars? It’s all so dainty and dreamy! Having the space to receive a friend or customer in your sewing room is a great idea. Place a nice couch in your room so they can stay comfortable while they wait to be fitted. You can try this unique sewing room arrangement for a change. There’s no shame in taking a nap or two on your comfy couch either! Keeping it carpeted and office-formal should be something you should consider, especially if you are planning to make sewing a legitimate business. This spacious and professional look will allow you to manage multiple sewing projects. Clients will also have a good impression of your sewing business should they pay a visit. This spacious fabric display sewing room looks quite impressive. With this arrangement, you can easily select and sew right away. Plus, there’s room to hang your finished products! It even has comfy chairs that give you a vantage point to marvel at the whole sewing studio. Stay bright and organized in white with this DIY home organization idea. Keep everything clean while you let your creativity loose and overflow onto your sewn masterpieces. The different types of fabric are stored neatly and beautifully, and they look amazing too! Plus, who could say no to a comfy pillow on a classic wooden chair? The sliding drawers of this working table bring magic to this sewing area. Let this amazing work table face the window so you have better light, and then store your sewing essentials right inside the drawers. It’s easier to clean up this way as well because all you have to do is to close the drawers! Red is a strong color that ignites a crafty heart and spirit. It represents love and happiness. Keep things organized with this gorgeous shade. We have a feeling you will finish your sewing projects quicker with this color scheme. Don’t have space to carve out a separate sewing room? These woven baskets are cute and efficient storage methods for a makeshift sewing space. When you’re in a hurry and there’s no time to sort things out, just toss them under the table for later. For more sewing room ideas, here are some tips on how to organize your sewing studio from Stephanie De Pasquale Soebbing. Enjoy! Change is good and it’s good to change. Customize your personal sewing room by getting bits and pieces from these sewing room ideas. You can go all white and vintage or sugar store. Don’t be afraid to move that table or relocate the sewing machine. How will you know what works best for you if you won’t even try upgrading now? Do you have any other tips and tricks that have helped you organize your sewing room? Please let us know in the comments below. all the rooms look great but most are impractical. The thing that bothered me most is the fabric stored openly with exposure to sunlight. As in as little as one summer all the fabric could be sun bleached on the exposed side/fold thus ruining it. This would be a good idea only in a room without windows. Secondly by putting sewing tables in a corner there would be no room to the left of the sewing machine (needle) for medium to large projects.. forget making drapes or quilts. and the most impractical would be having live plants that need water above threads that would be ruined by water dripping on them. These rooms were probably not designed by sewers. ok. I might agree about the sun bleached material. However, just move the material to a place that does not get direct sunlight. As for live plants, don’t position them above the threads. maybe bottom right corner. I agree that these sewing rooms are impractical, in the real world, many can’t afford all these nice cabinets. I don’t want all the knickknacks everywhere. I do however want a large cutting area and a large sewing area with extra room behind sewing machine for my quilts as I am quilting! If just dabbling in sewing, then they are very nice. Where are you putting all your fabric hoards? I use toilet paper empty rolls to store cords. I have TOTES of fabric! No way to keep it on display! I have mine inventoried and put into numbered totes so I can find what I need. At least 20 totes! I have buttons by color in drawers of storage units and the same with bigger drawers of thread. I have zippers divided by size and type and put into shoe boxes for easy retrieval. I have several machines and they are side by side with a chair that has wheels to slide from one machine to the next (sewing machine, serger, and blindstitch for hemming. My vacuum board is across from them to easily get to it when needed. I often use a cardboard cutting board that is placed on the vacuum board to cut things that are not terribly large, and put a banquet table up to cut larger things. May not be the magazine perfect looking set up, but its certainly the best workable setup for serious sewing. I agree these are not entirely practical… but the pegboards are good, and perhaps the material won’t be there for long and so fading won’t be an issue. It would be quite sad if these lucky sewers weren’t ‘serious’. To each there own.